Great MOCs, I love how their designs are similar yet slightly differing. no quaza spikes? i am turning away for youtube now!! 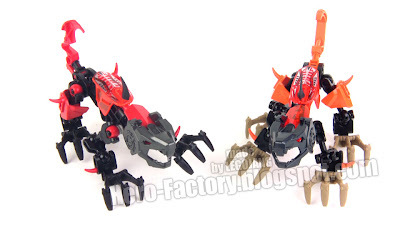 It looks to me as if their backs are covered in a Quaza carapace-ish thing. I don't want to encounter those guys! Hero Factory: Hero, any sign of danger? Hero: Not yet. What is that? Hero Factory: What is what. Hero: This cute, little, dog-like thing! Hero Factory: That thing could be dangerous! Hero: How could a cute little thing like this be cute! There is only one. And another. And another. And another. There is hundreds of them! Super cuteness. Give me a hug! Hero Factory: I don't think that's a good idea! Hero: Oh, what could possibly go wrong? They are all growling at me now. They don't look happy! Good Doggy! Prakons: GRRRRRRRRRRRRRRRRR WOOF WOOF WOOF! Hero Factory: Hero come in! @sup3rf4t: The reason why the Prakons don't have Quaza spikes is because they would be too big on a Prakon.